Pyongyang (AFP) - The Day of the Shining Star dawned bitterly cold in Pyongyang. 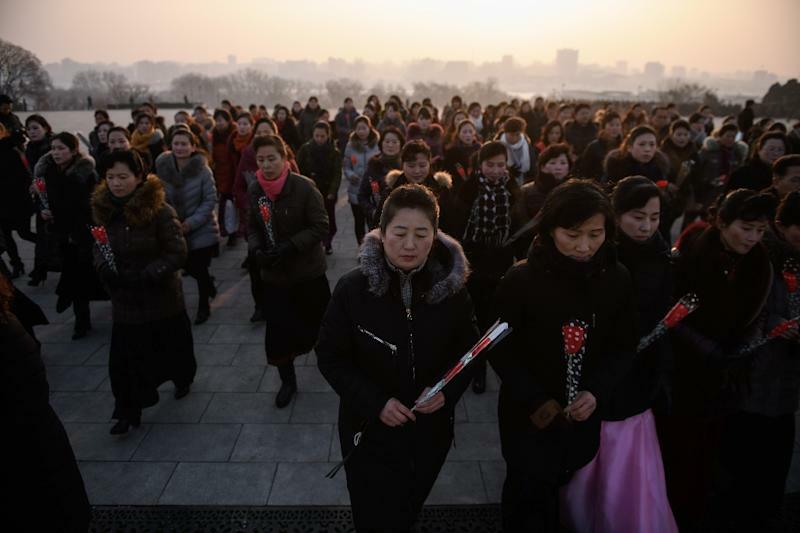 But thousands of North Koreans lined up in temperatures of minus 8 degrees Celsius on Saturday to pay their respects to late leader Kim Jong Il on his birthday. Kim, the son of the isolated North's founder Kim Il Sung and the father and predecessor of current leader Kim Jong Un, was born on February 16. According to Pyongyang's orthodoxy, he came into the world in 1942, in a snow-covered hut at a secret camp on the slopes of Mount Paektu, the spiritual birthplace of the Korean people, where his father was fighting occupying Japanese forces. Outside historians point instead to official Soviet records, which say he was born a year earlier in a Siberian village where Kim Il Sung was in exile. Either way, it is a key anniversary in a nuclear-armed nation whose people are taught from birth to revere the "Paektu bloodline", as the Kim family which has ruled it for three generations is known. Referred to as the Day of the Shining Star, the occasion is celebrated with flower shows, mass dances in the capital and elsewhere, and laudatory tributes in state media, all reinforcing the underlying narrative. 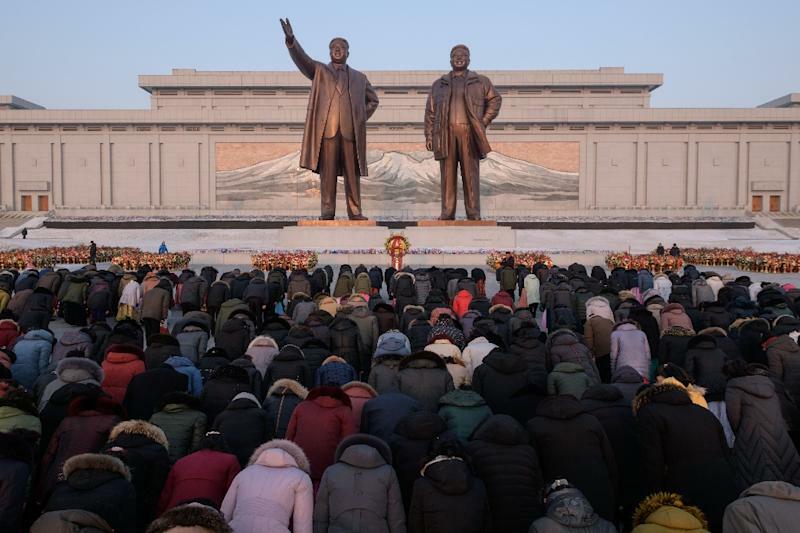 Driver Kim Chol Jun, 42, took his two boys to Mansu Hill, where giant statues of the two older Kims look out over the capital, to pay his respects to them and the current leader. "No sons and daughters feel tired when they visit their parents," he told AFP. "The great leaders are regarded as our own parents, so I visit here to bow before our parents with my sons." Ordinary North Koreans consistently express unequivocal support for the leadership and its policies when speaking to foreign media. Snow dusted the two monumental panels –- one to the fight against Japanese occupiers, the other to the building of socialism –- that flank the statues, their faces bathed in the light of the rising sun as small children swept the steps clean. In pride of place before the bronze effigies stood a large floral tribute emblazoned with the name of Kim Jong Un, who is due to hold his second summit with US President Donald Trump at the end of the month. Pyongyang is under multiple international sanctions over its pursuit of nuclear weapons and ballistic missiles, which Washington is pressing it to give up. 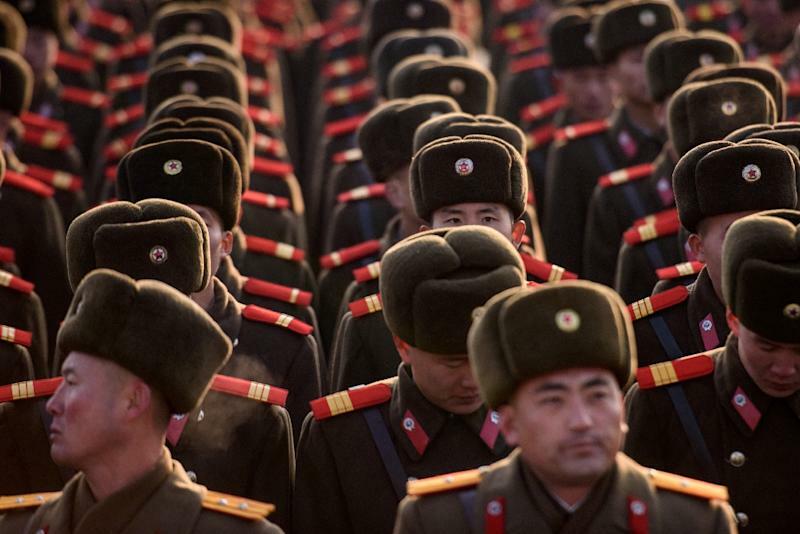 North Korea has rejected demands for what it calls its "unilateral" disarmament. At the statues, groups ranging from couples and families to hundreds-strong detachments of workers or soldiers assembled turn by turn in front of the images. After placing individual blooms or flower baskets before the figures, they lined up as an announcer intoned: "Let us pay tribute", and bowed deeply, the military personnel saluting. Kim Jong Il died in 2011 and his remains are preserved in a palatial mausoleum on the outskirts of Pyongyang, but officially he remains Eternal General Secretary of the ruling Workers' Party of Korea. Retired actress Ri Cho Ok, 77, instantly became emotional when asked about the late leader, her voice trembling as she described how much she missed him and how standing before the statues brought the incumbent to mind. Kim Jong Il was a film director himself and renowned cinephile, to the extent he had a top South Korean director and actress kidnapped so they could develop the North's cinema industry. Pyongyang says their eight-year stay was voluntary. "The great general taught me step-by-step as I was becoming an actress," Ri said, "and gave me many orders and medals." But, she added, "it was like I received all the honours in the world when I met him".